Build the Parrot’s pretty Perch and nurture her online! Build the Parrot’s Perch and help to take care of her! Sit her on the perch and put the pretty bow on her head! Feed her seeds in the pink tray as a reward for doing tricks! When she gets sleepy, tuck her away in her birdhouse for a nap. 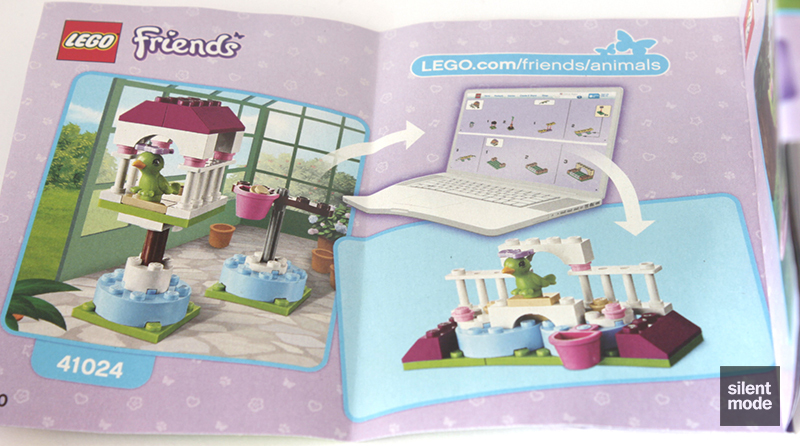 Take care of the parrot online and get lots of building inspiration at LEGO.com/friends! 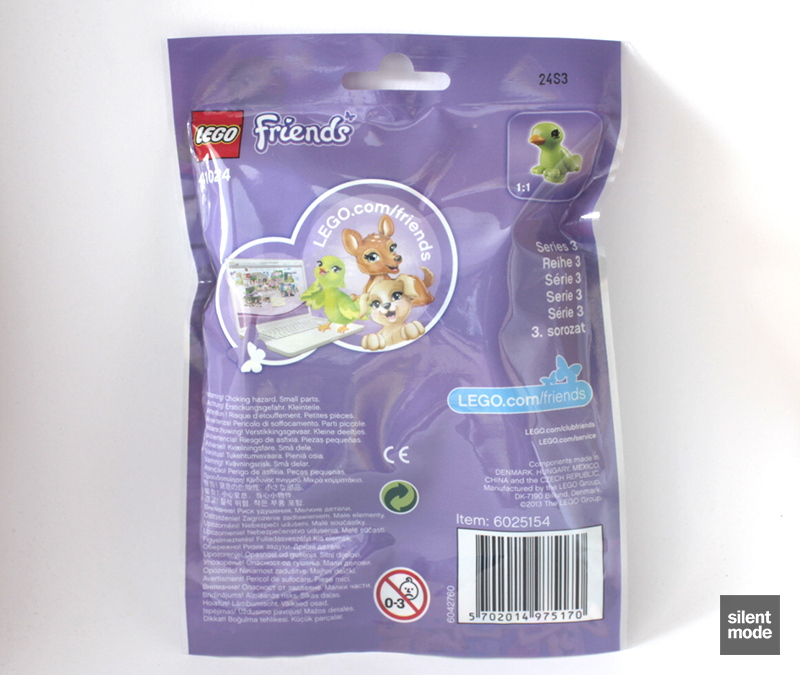 Combine with LEGO® Friends sets 41023 and 41025 to create a bigger habitat or playground for all 3 animals. Includes a parrot figure with bow accessory. Put the pretty bow on the parrot! 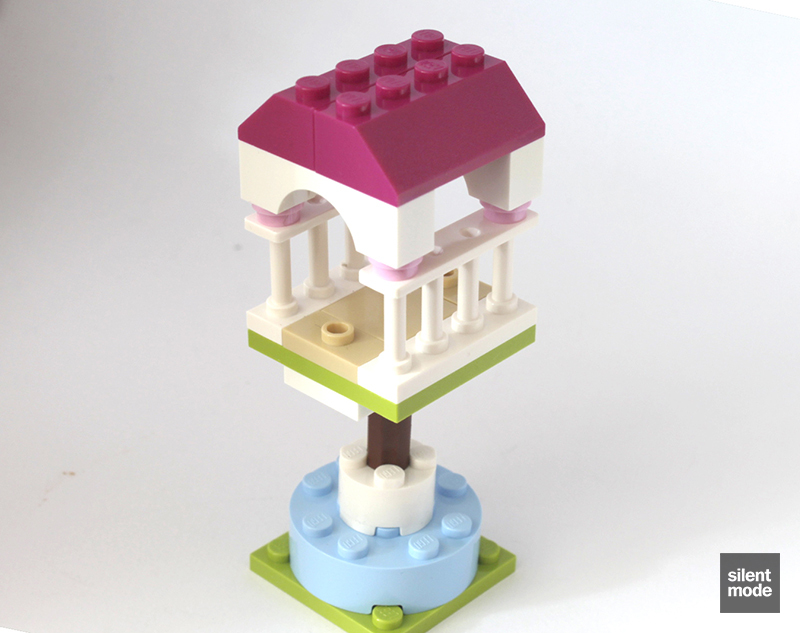 Take care of the parrot online, or find more building inspiration at LEGO.com/friends! 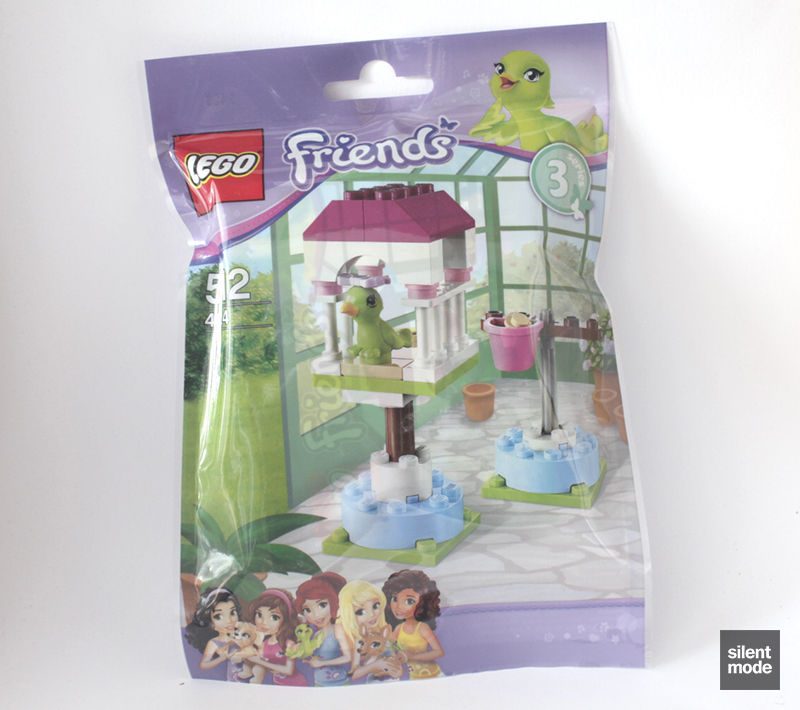 Combine with LEGO® Friends sets 41023 and 41025 to create a bigger habitat or playground for all 3 animals! The background does a great job of making the set look bigger and more substantial than it is, as usual. We’ll see how much by as we go along. The back of the packaging doesn’t reveal anything new, similarly to the other two sets in the series. Note that there’s no barcode label at the back! The bag of parts looks decidedly more girly than the other two sets, but the instructions are still nice and crisp. As we might have guessed, the two Bright Light Blue round bricks at the back are currently exclusive to the set, thought I’m not sure what else they could be used for just yet. The two fence parts in White are a nice addition, with everything else feeling reminiscent of older Friends sets. Not having looked at the packaging before the review, I had expected to see a brand new animal – but instead we’re given a re-colour of the bird from Olivia’s Tree House, which I don’t think would be accurately described as a parrot. This time around the bird is in Lime with a yellow beak, and pretty much has the same design. The bird is female (from the description above), and comes with a Lavender bow. This is such an incredibly simple build, I didn’t think it was worth taking pictures of the steps. Here we have a nice little perch that would suit either the parrot that comes with this set, or a minifigure-style parrot of any colour. Of note is that the 1×1 round plates that go in the basket are the Tan ones, not the Bright Pink ones (pictured). Somewhat reminiscent of Olivia’s Tree House is the construction of this bird house, using the remainder of the parts. The base is very similar to the perch, using the 2×2 round brick instead of the plate, and a Technic axle connector to form a thicker column. The jumper plates on both sides of the house mean the bird in this set can be placed on either side, and that the bird house can be rotated in either direction. If you’ve followed the instructions correctly you’ll end up with this. Whether or not you’re convinced the bird is a parrot, here we have the assembled flat-pack birdkeeping props from Billund. Perfect for placing outside of someone’s home, and the bird will sit just within a minidoll’s reach. The fewest leftovers of the series are in this set, but they’re more 1×1 round plates for your collection. Tan will be a particularly useful colour to obtain extras of. Again without looking at the instructions found via LEGO.com/friends/animals, this alternate build wasn’t hard to put together – it was a case of figuring out what other pieces (apart from the ones obviously shown) were included in the model. Of the three sets in the series, although I like the bird in this set more than the puppy from Puppy’s Playhouse, this for me is the weaker of the three – although it’s all right. There are a couple of parts I see as being useful in this set: namely the White fence pieces and Tan parts. The Bright Light Blue round bricks are a bonus as currently exclusive parts, for anyone who has an idea of how to use them. I’d say it’s worth getting one of these for the parrot, if you must have all the animals. For obtaining individual parts, the best bet is to wait for the set to be discounted, or take chances with [inflated prices in] the grey market. I understand using a re-colour of the bird from Olivia's Tree House, but it would have been great to have a model we haven't seen before. The resulting build is rather good with the limited number of parts. The build was very straightforward, with only the application of the axle connector (Reddish Brown part) posing a challenge. For me, very few significant parts are available in this set, with most commonly found elsewhere. It is a nice cheap way of picking up fence pieces, however. 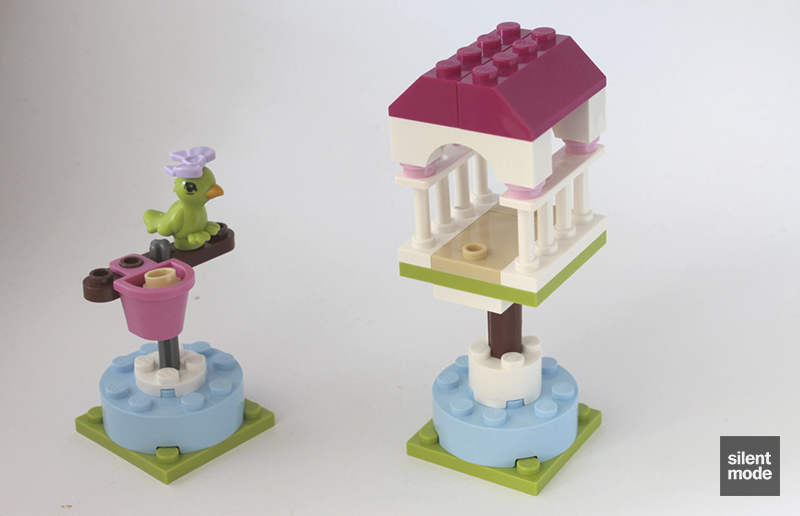 Easily a set that is better served as part of a larger set, such as Olivia's House, but at the very least accompanied by one of the other sets in the series. It's okay for the price, but I'd wait until this set is discounted before purchasing more than one. I’m not quite giving this bird the bird, but it does get 6.0/10. Besides having a Lime bird for your collection, I don’t think much would be missed. That’s all for now, and apologies if this sounds like a lazy review. We’ll hopefully get back into the really exciting stuff in the near future.